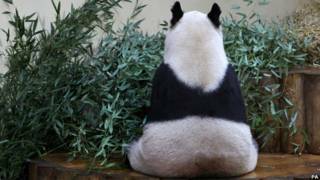 Image caption Tian Tian the panda takes a rest in her enclosure at Edinburgh Zoo. Photo by Andrew Milligan. Britain became home to giant pandas Tian Tian and Yang Guang in December 2011. The bears made their home at Edinburgh Zoo, where it is hoped they will breed. There are an estimated 1,500 pandas in the wild, making them one of the world's most endangered species. I'm telling you the situation is black and white – we've got no money left! Other people have opinions, too – it's not all black and white, you know. She had such a black and white view of the project that she wasn't prepared to discuss any other ideas. I know a little bit about biology and chemistry, but physics is still a grey area for me.